I received a call from a frantic mother of the bride regarding a cake on Friday. She asked if I could do a cake for the next day (Saturday). I said sure, unbeknown to me, I had no idea she meant wedding cake. The cake was prepared with a marble cake with chocolate buttercreme frosting filling on the bottom, chocolate cake with chocolate buttercreme frosting filling in the middle and strawberry cake with strawberry filling on top. 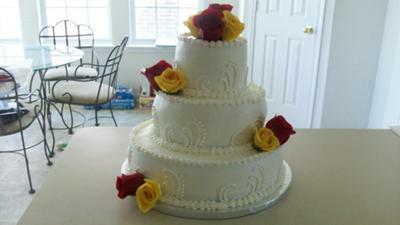 The colors were red and yellow, so I placed red and yellow roses on cake alternating tiers with a scroll design. I started the cake at 9:00 p.m. Friday night and finished with everything around 4:30 a.m. Saturday morning. At the end of the day, I enjoyed the adrenaline rush.